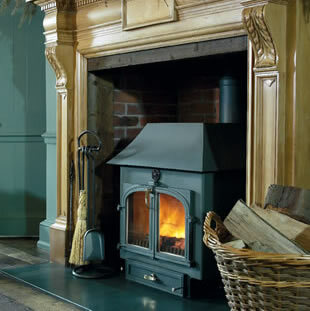 Clearview Stoves 750 13-15kW CLEARVIEW Stoves 750 STANDARD FEATURES Two large Clearview double glazed doors. Hot ‘air wash system’ for really clean burning without fuss or pampering. Independent up draught and down draught air distribution system for maximum response and control. Refractory lining, promoting clean combustion. Large hot plate surface for coffee pot or kettle. Heavy steel construction – welded inside and out for durability and long life. Stainless steel ash pan for easy ash removal. Optional top or rear 178mm (7 inch) diameter flue. Adjustable hinges and door catch to maintain air tightness throughout the life of the door seals. Solid brass removable door handle. Adjustable levelling bolts, for easy adjustment on uneven hearths. Maximum gross heat output: 13 - 15kw OPTIONAL FEATURES Six beautiful colours: Conifer Green Welsh Slate Blue Golden Fire Brown Mahogany Brown Honey Glow Brown Classic Black Available: Flat Top, Low Canopy (see left) or High Canopy (see above). External air kit, for direct connection to outside air supply. 7" (178mm) or 10" (254mm) plinth. Boiler Opions: 1) 10,000 B.T.U boiler 2) 27,000 B.T.U boiler 3) 45,000 B.T.U boiler. Back Boiler Stove. Stoves with Backboiler.